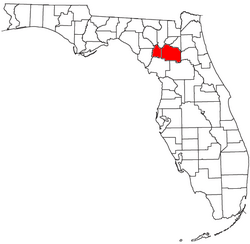 " North Central Florida" is a region of the U.S. state of Florida which comprises the north-central part of the state and encompasses the Gainesville Metropolitan Statistical Area (Alachua and Gilchrist counties), and the North Florida counties of Bradford, Columbia, Hamilton, Lafayette, Madison, Marion, Putnam, Suwannee and Union. The region's largest city is Gainesville, home of the University of Florida, while the largest metropolitan area is the Ocala Metropolitan Area. Other principal cities in the region include Lake City, Live Oak, and Palatka. As of 2010, the region had a population of 873,189. Like the Florida Panhandle, this region is often recognized as part of the Deep South, as compared to the rest of the state. The majority of white Americans in North Central Florida are traditionally of relatively unmixed English ancestry. The landscape and climate of North Central Florida does not portray the sub-tropical environment most associate with Florida. The landscape of North Central Florida has gently rolling hills dominated by magnolia trees and large Southern live oak hammocks draped with Spanish moss. North Central Florida has a few cities and many small towns or settlements, some of which are along rivers and lakes. Unlike Central Florida and the Suncoast area, North Central Florida does not have many amusement parks or large theme parks. Instead, it features many parks with nature as their theme. North Central Florida also has many small turn-of-the-century towns that represent the culture of the Deep South. A significant attraction of North Central Florida is that it is the main location of the University of Florida, and the site of the stadiums for its sports teams, the Florida Gators. North Central Florida Facts for Kids. Kiddle Encyclopedia.